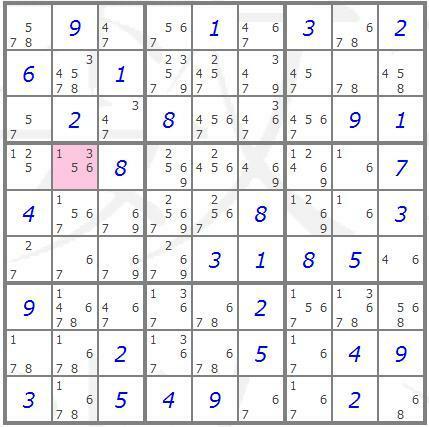 The hidden single solving technique is a very effective but still simple solving technique. Using this technique the candidate values of all empty cells in a given row, column and box are determined. If a given candidate value appears in only one cell in a row, column or box then that must be the value of the cell. 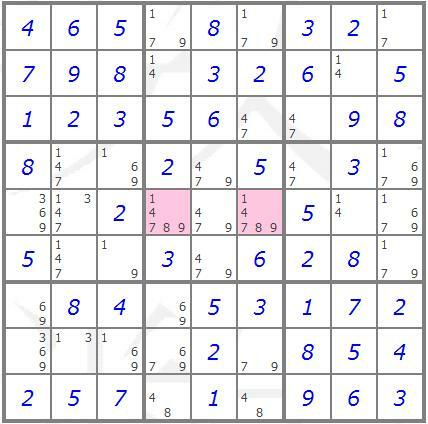 The highlighted cell in the Sudoku below has the following candidate values 1,3,5,6. It is however the only cell in the box which has 3 as a candidate value, therefore the 3 must go in this cell. The "hidden pair" solving technique is an intermediate solving technique. Using this technique the candidate values of all empty cells in a given row, column and box are determined. If a given pair of candidates value appears in only two empty cells in a row, column or box then these candidates must go in these cells and all other candidates can be removed from these cells. Reducing candidate lists may reveal a hidden or naked single in another unsolved cell, generally however the technique is a step to solving the next cell. The highlighted cells in the example below show a hidden pair in the box in the centre. Since the candidate values (1,8) only occur in these cells, all other candidates can be removed from these cells. The resulting naked pair in row 5 allows the candidates (1,8) to be removed from all other cells in that row, which in turn reveals a naked single. The "hidden triple" solving technique is similar to the hidden pair solving technique described above. In a hidden triple, three cells in a row, column or box are the only cells which contain three particular candidates. This allows these candidates to be removed from all other cells in that row, column or box. The "hidden quad" solving technique is similar to the hidden pair solving technique described above. In a hidden quad, four cells in a row, column or box are the only cells which contain four particular candidates. This allows these candidates to be removed from all other cells in that row, column or box.